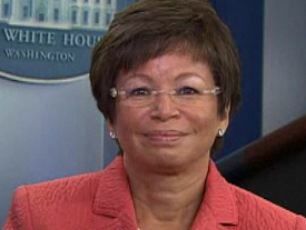 Jarrett: No Jobs Bill Yet; "President Is Going To Draft The Legislation"
Valerie Jarrett, White House senior adviser, talks with Rachel Maddow about the significance of President Obama's jobs plan to his presidency and what his plan is for its passage. Jarrett implies the complete jobs bill has not been fully written yet, however it will be by next week and the President will submit it to Congress for cost scoring. "Congress should pass this bill right now," Jarrett said on MSNBC. No more than one minute later, Jarrett said the White House is still writing the bill and it will be submitted to Congress next week. Jesse Jackson: Republicans Who Skipped Obama's Address "Unpatriotic"
Daley Hints Rich To Help Fund Jobs Plan: "Ought To Pay A Little More"